Final Results of an Incredible Event! Don't miss this exciting event! Admission is FREE! 2012 SEPAK TAKRAW SEASON IS HERE! WANT TO GET PAID FOR GETTING YOUR KICKS THIS SUMMER? Welcome to the official new website of the Sepak Takraw Saskatchewan Association! 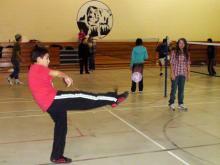 WELCOME to the official NEW website of the Sepak Takraw Saskatchewan (STAS)! Sepak Takraw is best described as KICK VOLLEYBALL or SOCCER VOLLEYBALL, and is a growing sport in Saskatchewan and across the country. Check out all the information available on this site, ESPECIALLY REGARDING OUR M.A.P. GRANT OF $250 - $750 TO HELP SCHOOLS/COMMUNITIES INTRODUCE AND DEVELOP THIS SPORT. Also check out many amazing pictures in the Media Library ... you'll get a sense of why this sport is so fun and considered one of the greatest spectator sports out there! • Sask Family & Corporate Challenge, Fun Recreational (modified games) Tournament, Regina, July 1, annually. The October STAS newsletter has been published. Read more to download! Welcome to STAS' new website!